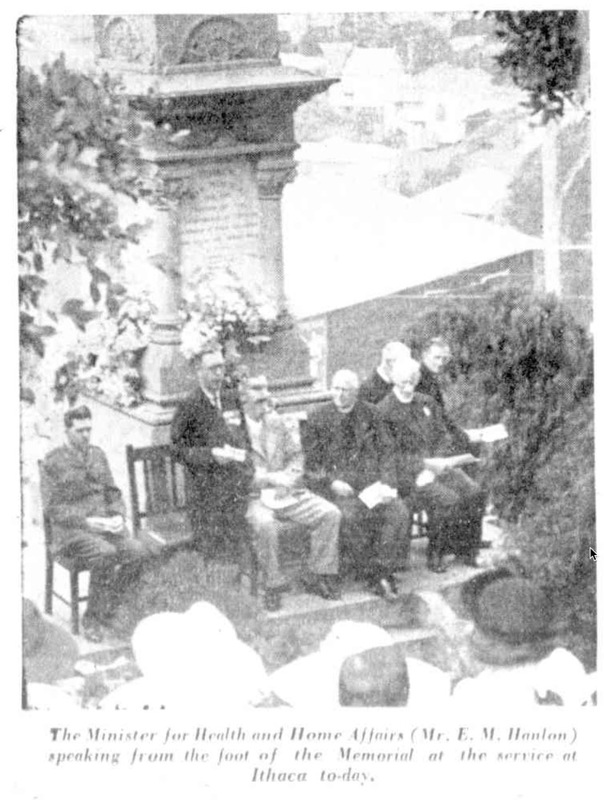 ABOVE: Queensland State Secretary for Health and Home Affairs (and future Premier), Edward (“Ned”) Michael Hanlon, addresses mourners, dignitaries and other locals from his constituency of Ithaca at the Ithaca Shrine of Remembrance on ANZAC Day, 1940. This image appeared on page 9 of that afternoon’s editions of “The Telegraph” newspaper. 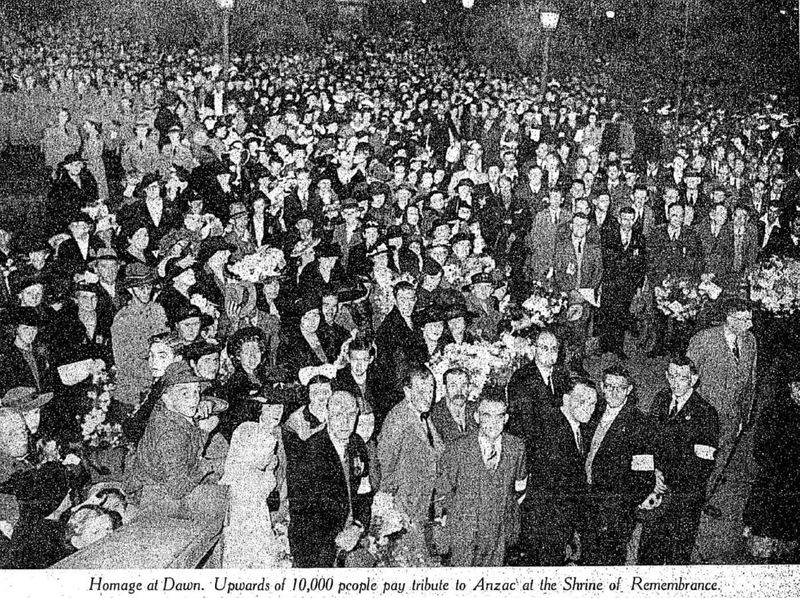 “THE ANZAC Day Commemoration Committee has decided to again ask the churches, local ANZAC Day committees, sub-branches of the Returned Sailors’ and Soldiers’ Imperial League, shire councils, branches of the Country Women’s Association, and all other interested bodies to arrange for the observance of ANZAC Day on the same lines as in previous years, this being the dawn service where possible, morning services in cemeteries and in churches, and service in the principal churches at 11 a.m., to be followed, where possible, by lunches for returned soldiers, parades and memorial services in the afternoon, together with a public meeting in the evening,” writes the hon. secretary (Mr. E.R.B. Pike) [ Eustace Royston Baum Pike ]. “With regard to the public meeting, it is again stressed that this is not in any way of a religious character. “The minute’s silence at 9 a.m. falls during the period at which it is held. “This silence is to be again observed throughout the State at this hour, all traffic being asked to stop and machinery to cease work. “The Commissioner for Railways has again approved of all trains stopping for one minute at 11 a.m.
“This has become the practice owing to the danger of trains stopping after dark. “At the evening meeting the uniform resolutions will be again submitted. “It is hoped that attractive programmes will be provided so that people will be encouraged to attend at functions where those of all religious and political beliefs can unite in expressing their loyalty to the King and Empire, their gratitude to those who participated in the last war, and their determination that they and their dependants shall not be forgotten. “The Committee feel that although the Empire is again engaged in war, all citizens will still desire to remember in a fitting manner the sacrifices and heroism of those who participated in the war of 1914-1918. “It is suggested, however, and the resolution for the public meeting has been suitably altered to this effect, that reference should be made to the present War and to those who are following the example of the men and women who participated in the previous war. “The committee deeply regret the death of Canon D.J. Garland [ David John Garland ], who was so closely connected with the observance since he attended the inaugural meeting, where he was appointed as honorary secretary. 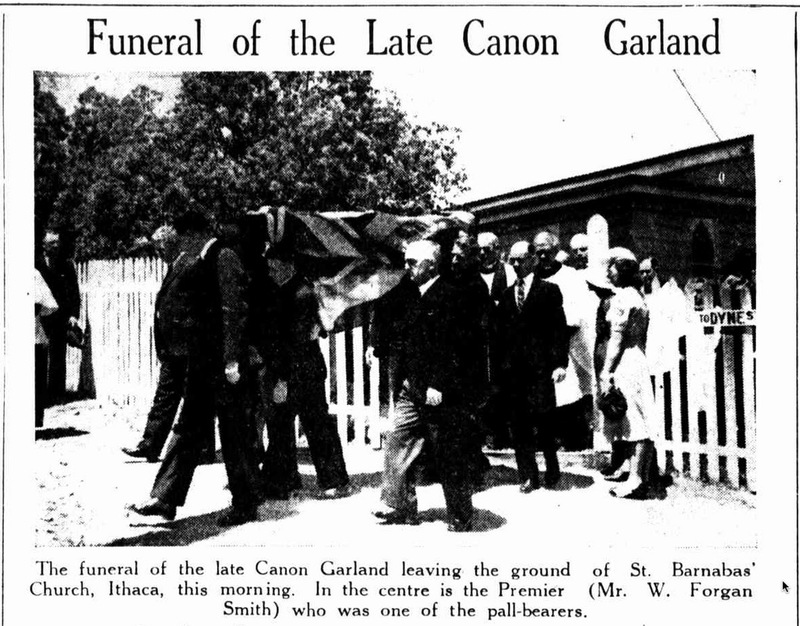 “Canon Garland was responsible for the drawing up of the programme for the observance, which has been followed with hardly any alterations since ANZAC Day was first observed in Queensland, and for the inauguration of the minute’s silence. “The committee hope that the characteristic features of the day, making it a Holy Day, and not a holiday, will continue. 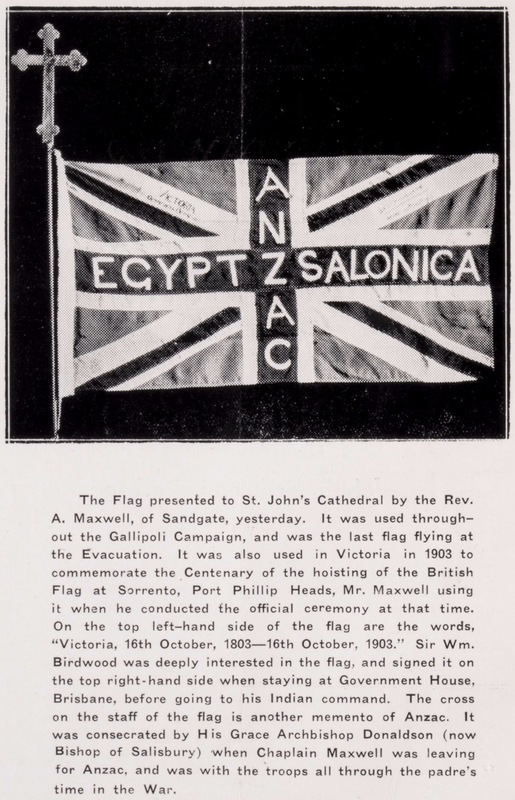 “Suggestions for the observance, the usual posters, windscreen stickers for motor cars have been forwarded to those concerned with the organisation, and copies of the ANZAC Day Book will be available. – from page 6 of “The Morning Bulletin” (Rockhampton) of 20 April 1940.